There was a very excited buzz in The Parabola last night – ten Moogs on stage, of varying sizes and instinctively you knew, of different temperaments, from the tiny Roland SH09 to the wedge shaped Korg MS20 and the archetypal Moog, the mini Moog ( illustrated). Their oscillators so sensitive that the mere opening of a door which causes the temperature to drop a millionth of a degree is enough to make them stop working. The Will Gregory Moog Ensemble, led by the composer Will Gregory (half of Goldfrapp) gave us two hours of great fun but also poignancy. They warmed us up with Handel’s Bourrée, just enough to get our ears attuned. Then Bach’s Brandenburg Concerto No.3 delivered at high speed like a giant fairground organ. But they hadn’t really got going yet. Will explained you can sequence the Moogs – hands appeared to be lifted off the keyboards, just a few knobs were twiddled and we had a premiere Carry on Noise Box, which ended up as techno with layers of white noise. By this time a small group in the gallery were dancing and the rest of us smiling with glee. Then what else but some Burt Bacharach to ease us to the interval? We’d had fun, we’d experienced wails, howls and pulsating rhythms. It all felt, well, very human. 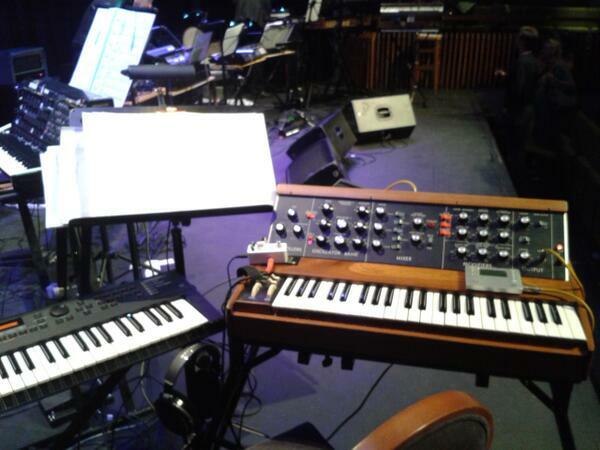 These were not machines being controlled by musicians, the Moogs had won us over with the breadth of emotions they displayed from sheer joy and bounce to deep, gut tingling throbs. It was worth coming back for The Service of Tim Henman , through-composed by Will to a film about the tennis player. But nothing could have prepared me for this extraordinary work – a slow motion film which covered just a few seconds of a game but shown in very very slow motion. It enabled us to slip inside the soul of Tim Henman through his steady gaze and cool eyes, to experience the loneliness of being on court, of the aggression you have to feel to win, and the desolation at a poor shot. The score emphasised the pounding energy of tennis, the brutal nature of combat where you have no time to reflect on a victory but must plan the next move, and the next until you win. Or lose. I do not know how the game ended, the camera in Henman’s face as he left the court seemed impertinent, we’d experienced so much with him. And who would have thought that Moogs could do that?